Are you ready to experience the rich history of west Africa and participate in the 4th Annual African Kundalini Yoga Festival? This year’s theme is Commitment: The First Step Towards Happiness. Please see below for details on payment, vaccinations, visas and round trip airfare. Call us at 323-735-0500 with any questions. Sat Nam! 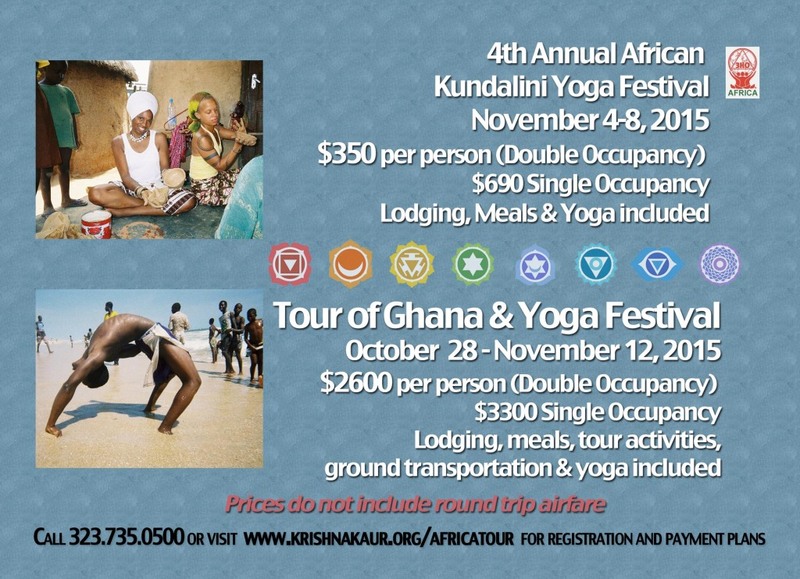 TOTAL $2600 for Double Occupancy includes complete Tour of Ghana and four day Yoga Festival hosted by 3HO Togo. The total for Single Occupancy is $3300. This cost includes all ground transportation, double occupancy lodging and meals. Email info@krishnakaur.org to register. Addition fees apply for the Ghana multi-entry visa ($100) and Yellow Fever vaccination (check with your local health provider). We are happy to help you book your flight to Accra, Ghana or Lome, Togo. Recommended airlines include KLM Royal Dutch Airline, British Airways & Delta Airline. Current round trip tickets from Los Angeles to Accra, Ghana are $1,000-1,5000.